When temperatures are in the record-breakingly low negatives, there're basically only two things you can do: 1) find an unoccupied tauntaun carcass, or 2) find a bar with a fireplace. 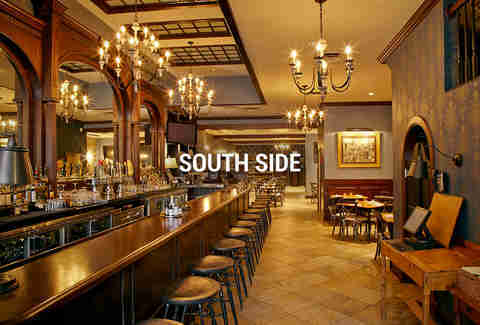 Helping you with the latter, this guide to FIFTY fireplace-equipped Chicago bars. Once you get past all of the James Van Der Beek references, hit this West Loop mega-restaurant's private room, which features denim walls (?) and a back-of-the-room wood-burner. 114 domestic and international beers on tap + Tomato powder-crusted venison + Fireplace = Yes, please. This State St mainstay oozes classic appeal -- the walls glow a vibrant red, every seat in the house is upholstered with plush, smooth leather, and a roaring fire blazes in the, um, fireplace. Order a stiff drink, a wild pheasant pie, and stay a while. The Champagne, charcuterie, dim lights, and cozy hearth set the stage for a romantic evening with someone special; let your good looks/wit/generously proportioned man-organ do the rest. Step 1: Settle into the fire-facing couch at this American farm-to-table restaurant within the Four Seasons Hotel. Step 2: Order their famous Mexican hot chocolate spiked with tequila. Step 3: Repeat Step 2. Futuristic, pod-like fire-starters elevate this drinks-after-work venue to something far beyond your average sports bar. Add mushroom-truffle pizza to the mix, and things get downright classy. 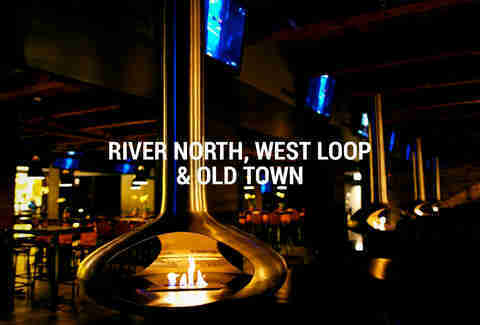 Chicago’s premier rooftop stop for drinking, seeing, and being seen keeps the party alive all year long, thanks to a retractable roof and an ultra-modern/Beatles-y white fireplace. It’s not exactly Margaritaville, but just in front of the contained flames at this River North outpost proves a worthy spot to throw back a couple icy margaritas (may we suggest the Mango Mint Gingerita?) over a shared order of fresh guac made tableside. Take in picturesque views of the city from this rooftop bar at the Raffaello Hotel, while imbibing high-end cocktails like the Back to the Future featuring Del Maguey Vida Mezcal, crème de cacao, Kochi American, lemon, orange, and hoverboards that don't work over water. Throw on a booze jacket and warm-up at the fireplace in the indoor lounge. This swanky destination (which also made our list of the Best Cocktail Bars in Chicago) is known for its epic cocktail list, delectable bar snacks, and a sleek electric flamer that keeps its cool Downtown crowd warm. Fire and ice team up for an elemental experience at this al fresco lounge. Dress warmly, belly up to the famed ice bar for a ginger-infused King’s Sake, and enjoy it beneath a comfy fur blanket by their fire pit. You can dine like a king with fresh cuts of fire-grilled skewered meat served tableside, and the option to turn any single-serving craft cocktail into a pitcher for the table/just Rip Torn. This restaurant’s focus is Italian cuisine served tapas-style, which means you can get more variety without obscene portion sizes. Dine outside in the Summer, or near the fire in the Winter. And don’t go without the penne alla vodka and some house-made gelato. Right beneath public transit, this lounge is home to plush, velvety couches situated next to a fireplace. $5 specialty martinis flow every Wednesday night, along with $4 fresh mojitos on Thursdays. This pioneer-inspired eatery is one of the only restaurants in Chicago offering whole-animal services, ranging from alligator to wild boar. Better still, there are multiple fireplaces scattered throughout the interior and beer garden spaces. Situated on the rooftop above Root’s Pizza, this heated haven is now open year-round, and boasts absurdly creative cocktails from Beverage Director/mastermind Ben Schiller. Warm up by the fireplace and with the Weston, a bourbon drink with Dark Matter Coffee essence and pipe tobacco. Pull up a seat around one of Bluebird’s 100yr-old reclaimed-wood tables, order your choice of wine or craft beer, and enjoy the vintage vibe pulsing through the bar. The space also frequently holds great beverage-focused events and tastings that can’t be missed. PBR is always on tap at this Wicker Park lodge-y hideout. Pair your cold one with some comfort food like meatloaf, a game of darts, and some friendly banter by the flame-maker. With its wood-trimmed fireplace and beautiful brick back-bar, this prim and proper drinkery is ideal for thirsty people looking for cheap drinks without the dive-y ambiance that typically follows. Enjoy $5 Long Islands every Sunday. This bar and grill is a glorified eat-drink-and-be-merry party house for sports fans. The space is heavy on wood and iron, and comes equipped with a retractable roof, a pool table, and a place to toast your s'mores. When life gives you a half-pound, grass-fed beef burger with grilled & pickled onions and white cheddar, you eat it. And pair it with a beer flight. And a nice spot near the fire. Mismatched furniture, stained-glass windows, a mosaic mural, and a huge, gas-powered fireplace make this one of the most eccentrically decorated places to get your pool game on. From Chicago watch parties to holiday-themed shindigs, there always seems to be something fun going on that involves craft beer at this Lakeview mainstay. Also: fireplace. 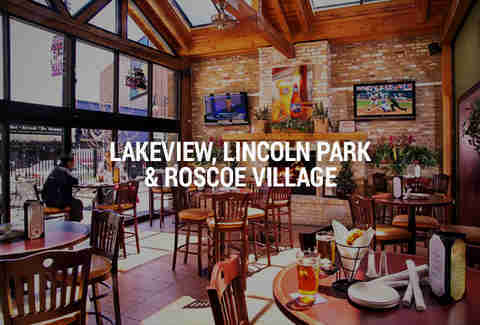 Nestled in the heart of Lincoln Park overlooking a pond, this cozy restaurant is prime for city views and a seasonally-inspired tasting menu. 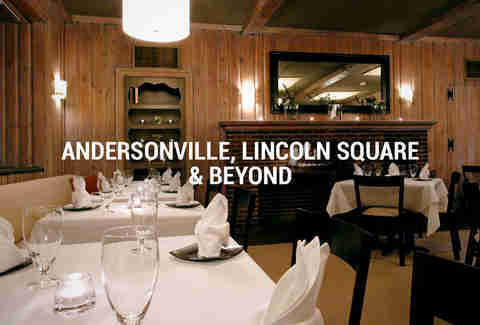 Request a table near the fireplace... you deserve it. As with many of the bars and pubs on this list, this joint pushes all sorts of daily food and drink specials. There are also a variety of events to partake in, so plan your visit accordingly. This is the go-to bar before or after a Cubs game, so if your allegiance lies anywhere but within the friendly confines, you may want to steer clear. Take advantage of the daily drink specials, which are significantly cheaper than ballpark prices, and enjoy the warmth of an f-place when weather conditions don’t hold up. So... now. This quaint, urban-chic wine bar is great for casual wining and dining, and offers bar seating, soft chairs for lounging, and a fireplace. 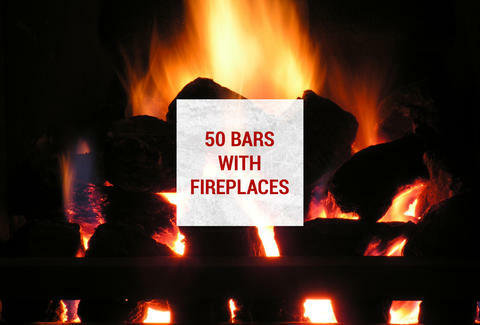 Because this round-up is all about bars with fireplaces (stay with us!). Go for the Butcher’s Plate for a shareable selection of bruschetta, cheeses, and meats. Catch the latest Notre Dame game (go Irish!) at this deceptively spacious neighborhood bar outfitted with just enough exposed-brick to attract the young professional crowd. Specials are available most days of the week, including half-off burgers on Thursdays and half-off bottles of wine on Mondays. Dubbed Chi’s official hangout for Indiana basketball and Nebraska football, this neighborhood bar delivers on quality bar fare and a solid drink list. Snag $4 hard ciders and $2 pretzels on Fridays, a $5 trio of sliders on Saturdays, and $5 Miller and Coors stadium cups on Sundays. Go for the Duffy’s Euchre League, stay for the House Party every Friday night. $3.50 drafts and a fireplace are just bonuses. When a place identifies itself as an “Irish pub”, great beer, impromptu Irish drinking-song sing-alongs, and wicked St. Patrick’s Day parties are a given... and here, you can enjoy all three fireside. Find a cozy lounge, a full-service bar, and hardly boring menu (hello, baked brie, BLT mac ‘n’ cheese, and stuffed beef tenderloin) at this little neighborhood tavern. On $5 Mondays, you score with $5 $0.50 PBRs (! ), Taleggio funnel cake, and a cozy spot around the outdoor fire pit. With not one but two fireplaces, more than 40 gin varieties, and 12 single-brewery drafts, this neighborhood spot has something for the G & T devotee, the adventuresome cocktail drinker, and everyone in between. 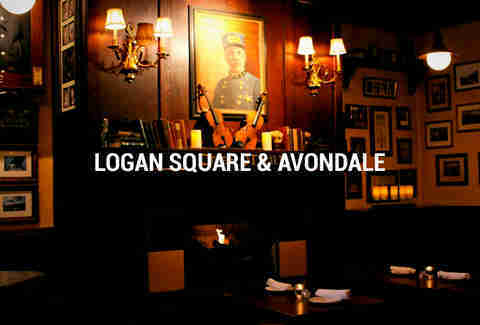 This Irish pub gets dressed up with white table linens, an elegant fireplace, and gourmet Irish-influenced fare. The Scotia Eggs and Shepherd’s Pie are standouts, as well as the whiskey selection and the all-you-can-eat Sunday brunch buffet. This tavern exudes 18th century appeal with dark wood, damask wallpaper, and an old-fashioned fire-thingy juxtaposed with modern-y fare like beer-battered cheese curds and sunchoke & bacon salad. This kitschy, Old World, Italian outpost is perfect for getting warm with friendly conversation over an antipasto platter and cheap domestic beers. This low-key tavern is one of Garfield Ridge’s hidden gems. Score $1.50 drafts and $2.75 domestic bottles and mingle with the regulars near the flames. Located next to the Old Town School of Folk Music (paaaaarty! ), this inviting pub hosts musical talents on weeknights at 9p, serves up hearty Shepherd’s Pies and Beef & Guinness stews, and is home to a respectable selection of beers and whiskeys you can drink by some fire. In the Summer, hit the beer garden. In the Winter, find a candlelit table near the fireplace and order a hug in a mug like the Cinnamon Toast cocktail with amaretto, hot cider, whipped cream, and a dusting of cinnamon. When in Andersonville, do as the Swedes do: sip glogg, listen to some Scandinavian metal on your iPod, and warm your toes by the fire in Simon’s rec room. What’s better than the soul-warming combination of Belgian brews and a nice, little fireplace? When you think of something, let us know. We’ll be cozied up at this Uptown tavern. Go for the globally-influenced food that flirts with molecular gastronomy, stick around to squeeze out every glorious moment near the beautiful, brick wood-burner. 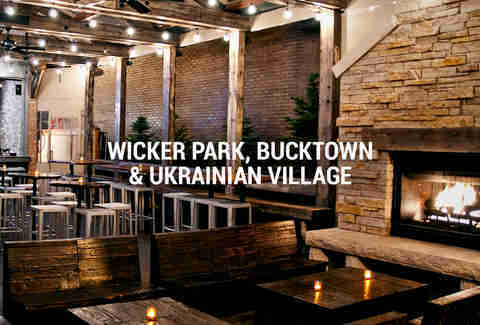 There are two fireplaces at this rustic restaurant’s Clark St outpost, and one at its Edgewater location. The food, drinks, and décor are all made with a green/organic mentality in mind, and many of the fresh ingredients come directly from the rooftop garden. Luxe accents like pin-tucked leather booths, built-in bookcases sporting a small library of old-timey reads, and a marble-finished f-place are like one grand invitation to get comfy and enjoy a juicy bison burger washed down with a bottle of Delirium Tremens. Have your pick of seating at an all-weather patio with a retractable roof when Mother Nature is feeling kind (so... never? ), or a warm spot by the restaurant’s namesake. Also: snag a half-pound burger for $5 every Thursday night. At one time, this historic space supplied local fire trucks with water. Now, it supplies you with beers, sandwiches, a contained fire, and water. There are rotating daily drink specials, so be sure to check their Facebook page for specials updates. This Old World watering hole boasts a creative menu and an equally creative and carefully selected list of libations, along with mahogany woodwork and an inviting fireplace. As the self-proclaimed best-kept-secret of the North Side, this neighborhood bar manages to stay effortlessly cool without pandering to a trying-to-be-cool crowd. Plus, a remarkable majority of the 16 beers on tap hail from local brewers/taste better when sipped by the fire. The hike to this Western Springs restaurant is worth the trip for three very important reasons: the incredible specialty cocktails, the fresh, local ingredients, and the tile-framed structure where Franklin D. Roosevelt totally would've held chats.